As a man or woman do you wish to have children? Are you pregnant? Do you breastfeed? Do you wish to have children, are you pregnant or do you breastfeed? Then please be aware of the possible risks associated with certain work activities. Your supervisor is obliged to ensure that you incur as few risks as possible during your work with regard to your own health and that of your infant or unborn child. Together with your supervisor you can investigate which tasks in your list of duties might pose a risk. You are also advised to discuss with your supervisor which measures can be taken to minimise these risks. Do this well in advance. Then you can simply carry on doing your work without any feelings of guilt towards your supervisor or concerns about your infant or unborn child. It is important to know which activities could pose a risk for you and your infant or unborn child. A brief overview is given below. Some hazardous substances can have a detrimental effect on the development or quality of egg cells in women and sperm in men. If you want to have children then you can agree with your supervisor that you will take extra measures to minimise your exposure to these hazardous substances. Determine with your supervisor which measures are needed to ensure that you work as healthily and safely as possible during your pregnancy. This applies to both you and your unborn child. If you work with hazardous substances then find out if these are dangerous for the unborn child (so-called reprotoxic substances). Radioactive, carcinogenic and mutagenic substances as well as some organic solvents can also pose a risk. 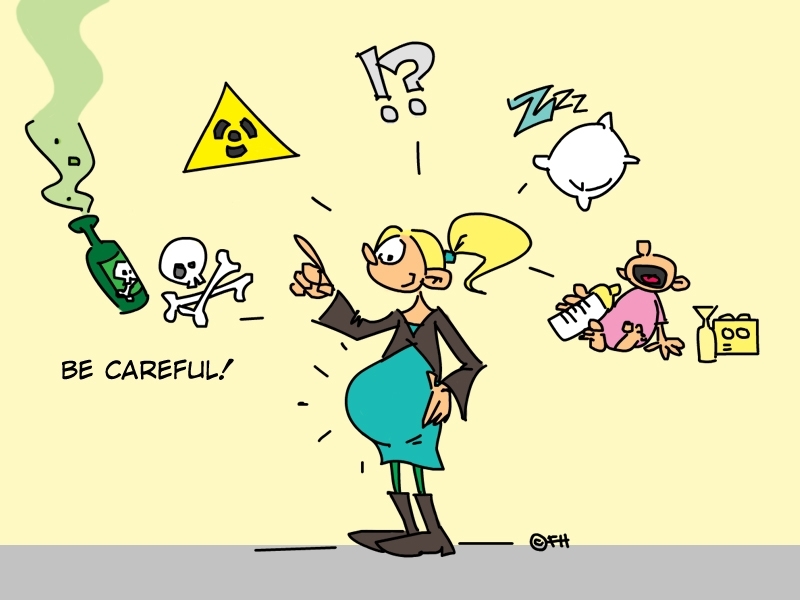 Other risks for pregnant women are stress, vibrations, magnetic fields and ultrasound. A checklist to help you identify the potential hazards can be found here. If you are pregnant then you have a limited right to extra breaks, and you have the right to allow pregnancy examinations to be performed during working hours. More information about your rights and duties during pregnancy and maternity leave can be found in this brochure of the Ministry of Social Affairs and Employment. After your maternity leave, you have the right to breastfeed or to express your breast milk for up to 9 months after giving birth. Your supervisor will make a private room and the necessary time available for this. Up until 6 months after giving birth you may request extra breaks. If you breastfeed then you must also be careful with certain chemicals. If you would like to know more about pregnancy and work then please visit these websites. On these pages you will find various links with information about the hazards of various substances and other pregnancy risks. You can also approach the central health & safety officer with any questions you may have.